It’s time to ride into battle once again as the Black Knight mounting a horse and clutching hold of your sword and lance to defeat the enemy and return to the King’s castle with big wins in tow. Of course, Black Knight 2 is a sequel to the original Black Knight slot machine and while you’d expect significant changes like there was in the Zeus slot series, the changes in Black Knight 2 are mainly cosmetic. The appearance has a much slicker design that retains the medieval theme, plus there are medieval sounds from the battle field that ring out – making it clear to see that WMS took negative feedback about the standard sounds in the original on board and it certainly makes you feel like you’re in the thick of the action. What’s The Structure This Time? The Black Knight 2 also has a differing structure than that of the original with 5 reels and 40 paylines (which is ten paylines more). With staking options from 1p to £3 per payline this enables you to spin the reels for 40p up to £120 per spin which means the lowest spin here is higher than the original (40p here but 30p in the original) while the maximum spin amount is lower (£120 here whereas the original enabled you to play for £150) which may put off the high rollers amongst you. On top of this your odds of winning are a little decreased compared to the original as the Black Knight 2 slot machine has a 95.91% RTP while the original boasted a slightly higher 96.07%. As alluded to above, this time around the symbols have a revamped feel which makes them appear more modern but the medieval theme is still portrayed across the reels perfectly. In total there are twelve symbols with two of these being special – the Wild and Feature. The Wild is the Black Knight himself on horseback covered head to toe in armour plating and unlike how online slots work most times it can actually substitute for ALL symbols – even the Feature, though it does only appear on the second, third and fourth reels rather than across all five. The Feature is just another term WMS use for the Scatter and this is represented by the Black Knight’s shield which is needed for the free spins mode. The King stands proudly with his gold crown as the highest paying standard symbol with five on a single payline worth 12.5x your stake with the stunning Princess and Royal Jester being the next most valuable, followed by a crown on a cushion, an ornate ring, mace and standard Ace to Jack playing card symbols which have the lowest payouts of all. 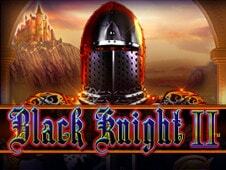 The free spins mode in the Black Knight 2 slot machine is much the same as that in the original slot. It is triggered by landing the Black Knight Shield (Feature) symbol on the first, second and third reels during the same spin. This then sees you presented with a total of 7 free spins which does seem very stingy, but thanks to the Wilds can prove to be very lucrative. If you succeed in landing a Wild symbol on the second, third or fourth reel you’ll witness it expand to cover the entire reel and lock in place until the rest of your spins play out. Theoretically this can see you achieve 3 locked in stacked Wilds for incredible wins, but a major disappointment is that you cannot retrigger additional free spins. You couldn’t in the original either but like many players we had hoped this would be a change for the sequel, oh well! Has it Won the Battle? If I had to choose between the original and Black Knight 2 I’d certainly opt for the sequel due to the superior graphics and sound effects, however it certainly doesn’t differentiate much. Personally I think there are much better medieval slots such as Microgaming’s Avalon slot because the only reason to spin the reels of the Black Knight 2 is the free spins mode. While 7 free spins is nothing not going to overwhelm you, the sticky stacked Wilds available here may well do – especially if you land three of them!